FAQ: Animal Care - Perelandra Ltd.
How in the world do I get my cat to take these Solutions?! 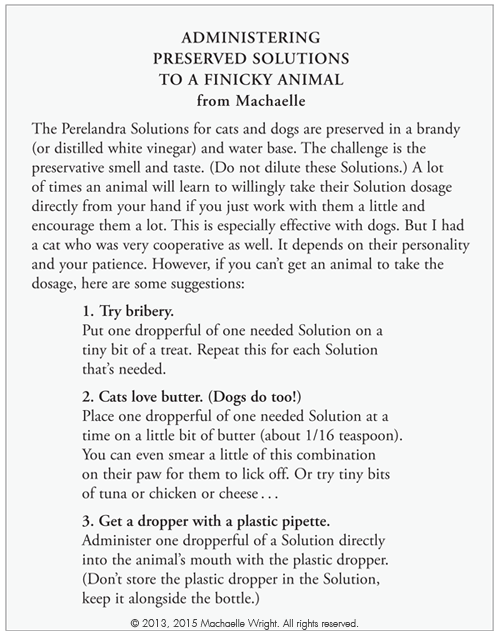 And if you're using PIC for your animal, see this special PIC FAQ post from Machaelle here. Where can I get plastic droppers to administer the solutions to my dog? You can purchase plastic droppers at most pharmacies. Remember: Do not store the plastic dropper in the bottle with the solution. Also, don't use the same plastic dropper in different solutions — it will compromise the solutions.